The circus involves death-defying feats and expert clowning, along with sideshows, animal acts and a ringmaster to act as the master of ceremonies. Nearly everyone has seen a variety of circuses and is familiar with the performers that commonly appear. Create skits that spoof these common circus acts by developing a clown routine, a three-ring circus takeoff, animal acts or a flea circus. Collect three people who have either very weird or very ordinary talents, such as wiggling their ears, rolling their tongues when they stick them out, shuffling cards, or putting on and tying their shoes. 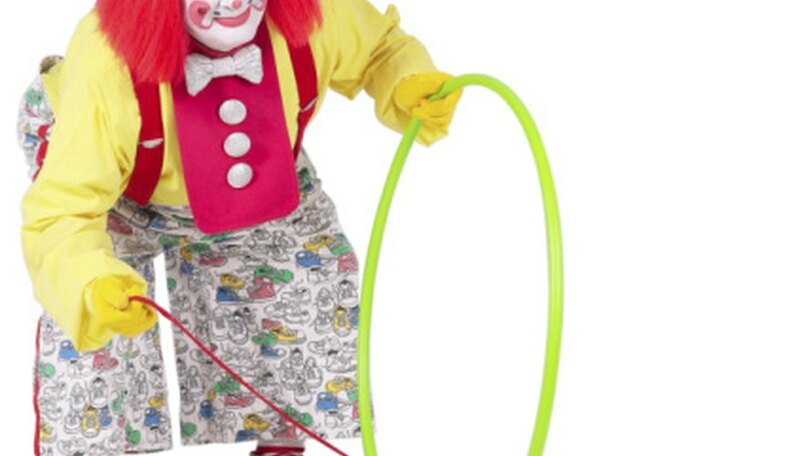 Have someone dress as a ringmaster and set up three rings in your performance area. Have the ringmaster announce, in a booming voice, each act as exotic and amazing. For example, the ringmaster could announce someone shuffling a pack of cards by saying: “Ladies and gentlemen, direct your eyes to the center ring and witness, for the first time viewed by human eyes, the mixing of cards at the speed of light!” Have the ringmaster shine a “spotlight” flashlight on each act as he announces it. This can be a comic circus skit whether you use real dogs and cats or have actors pretending to be animals. The trainer should have some classic animal tricks prepared – jumping through a hoop, barking or meowing on command and jumping from one perch to another, for example. If you have real animals, the humor is in how NOT trained they are. If you signal for your dog to jump through a hoop, he might wander over to an audience member to be petted, for example. The idea is to go with the “embarrassment“ of the failed tricks. For people who are pretending to be dogs or cats, dress them in tutus and bows to make them look like circus dogs and have them jump through hoops and dance on their hind legs. Funny!